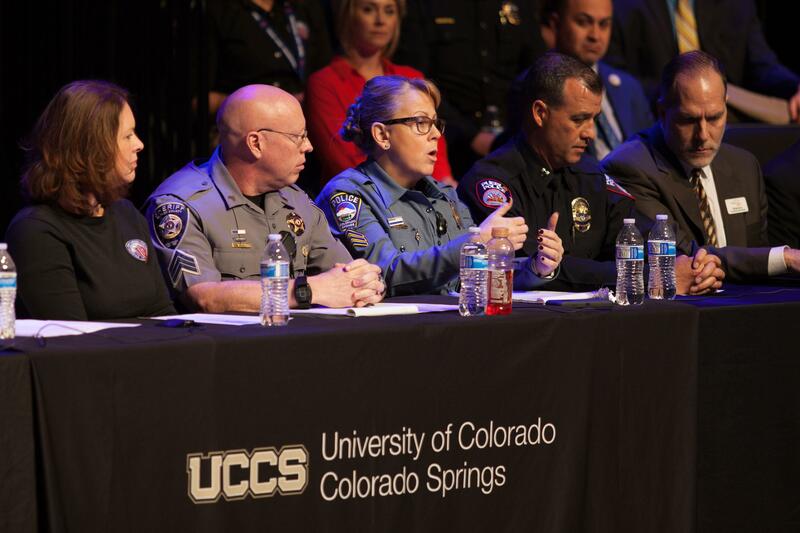 Law enforcement representatives speak at a school safety town hall at the Ent Center for the Arts March 12, 2018. Representatives from UCCS, the Colorado Springs Police Department, the City of Colorado Springs and Drive SMART Colorado will participate in a panel discussion on pedestrian safety on Austin Bluffs Parkway in a campus session at 1 p.m. March 21 in University Center 302. Panelists will answer questions from attendees about their concerns and listen to suggested ideas for improvement on the corridor. The conversation was sparked after the death of Zach Schlagel, a freshman pre-engineering student who was struck early in the morning of Oct. 29, 2017, while crossing the crosswalk. Vincent Fernando Garcia was arrested for vehicular homicide, accidents involving death, duty to report accidents and reckless driving. CSPD reported that Garcia ran a red light and was speeding at the time of the accident. In the past five years, Austin Bluffs Parkway has been expanded to six lanes and off-campus housing targeted to students has been constructed on the south side of the road. Fences were placed in the median by the city and apartment complex to prevent jaywalking before the housing opened, and CSPD implemented speed enforcement in the area in December 2017. Chancellor Venkat Reddy led efforts to begin conversations between the university and city to address vehicle and pedestrian safety on the road in November 2017. Joey Vijayam, president, UCCS Student Government Association, worked to bring city, campus and law enforcement officials to campus for this panel discussion. For additional information about the event or to submit questions for the panel, contact Heather Allen at heather.allen@uccs.edu.